Come join in the fun and laughter of our annual event for children and adults of all ages. Our New Location at the Mt. Juliet Community Center brings you Beautiful Antique Dolls, Classic and Vintage Dolls and Toys, Compositions, Modern dolls, Original Art Dolls, Hand crafted Dolls, Miniatures, Teddy Bears, Doll furniture, clothes, accessories and much, much more. 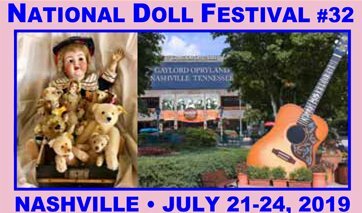 Featuring a variety of dolls, toy, and related items, antique to new. 8 foot tables ~ $25 ea. or 3 or more: $20 ea.